Amino AcidsFA Nutrition Xtreme Beef Amino - 600 tabl. Protein beef is the best source of nutritious amino acids. Reach for the product, which is based on protein hydrolyzate of bovine ensuring their quick assimilation and the highest quality supplement! FA Nutrition Xtreme Beef Amino - 300 tabl. 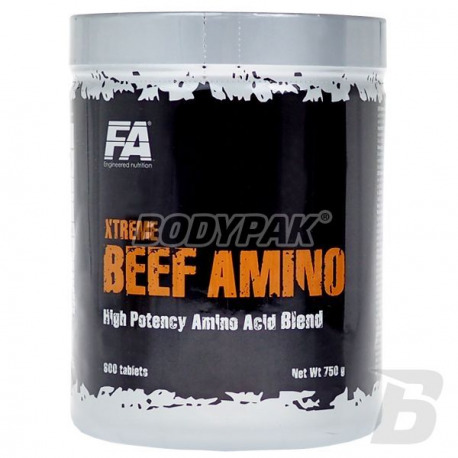 FA Xtreme Beef Amino is the power and force of amino acids from beef! Each athlete will tell you - the best source of protein is just beef, and that's what it enjoyed the greatest stars of the world of bodybuilding and other sports. FA Xtreme Beef Amino is the highest quality and bioavailability zhydrozlizowane beef protein, which is directly responsible for the formation of collagen and effectively supports the anabolic processes and protects the body from decomposition of muscle tissue during intense strength training, endurance, strength-endurance. FA Xtreme Beef Amino provides a comprehensive range of exogenous and endogenous amino acids and 3 unusual in the operation of the amino acids glycine, Hydroxyprolinę, Proline in the ideal proportions and up to a high concentration. Amino acids, which directly form the collagen in the human body. Collagen is the major structural protein, forming molecular particles that build and strengthen the tendons, muscle tissue, connective tissue, hair, skin and all internal organs. Also, bones and teeth of man are built by adding mineral elements to collagen. Beef Amino Xtreme FA is the force derived proteins red beef with a high amino acid content than other types of proteins. (Whey, milk, eggs). The hydrolysed protein is bovine even 350% more concentrated in terms of protein content than the popular beef steak and contains 0 0 fat, and cholesterol. FA Xtreme Beef Amino is recommended and designed for all people who practice physical activity as the presence of all amino acids in this unique formula provides maximum muscle adaptation to exercise performed. FA Xtreme Beef Amino recommended are also those who want to take advantage of essential amino acids, and this kind of quality beef protein in maintaining the health and soundness of their bones, joints, hair, skin and nails. Składniki: zhydrolizowane białko wołowe, substancje wiążące [E341, E460(i)], substancja wypełniająca (E470b), substancja przeciwzbrylająca (E551). Polecam ze względu na aminokwasy jakie są w tabeli. Mam już druga puszkę i jak na razie jest progres. Dobre aminokwasy wołowe! Lepsza regeneracja, znacznie lepsze przyrosty, dodatkowo cena jest również bardzo atrakcyjna!